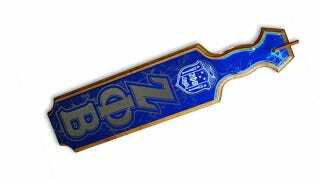 In another disturbing reminder that hazing isn't limited to idiotic frat guys, seven members of the Zeta Phi Beta sorority at the University of Maryland have been charged with hazing and assault for allegedly beating a pledge during initiation. The women are accused of pushing the pledge into a wall, hitting her arms and repeatedly striking her with an oak paddle, according to charging documents. Police say the assaults all occurred off campus and resulted in "severe bruising" on the student's arms and chest. The student claims that the sisters assaulted her at least three times. After initiation, she withdrew from Zeta Phi Beta and reported the hazing to university officials. The incidents occurred during October; in November the sorority was suspended and the school contacted the police. The victim's claims are similar to those of a San Jose State University student who filed a lawsuit against her ex-sorority sisters in September. Many Greek organizations truly have abandoned hazing rituals (the most nefarious aspect of my own sorority initiation involved collecting rolls of toilet paper), but clearly there are still some groups that consider beatings an important step in the process of becoming "sisters" for life.